The New Communist Party of the Netherlands (NCPN) and the Communist Youth Movement of the Netherlands (CJB) condemn the coup attempt that is in progress in Venezuela since Wednesday the 23rd of January, when the leader of the National Assembly of Venezuela, Juan Guaidó, proclaimed himself interim president. We also condemn the US, the other governments in Latin America of the so-called Lima Group and the Organisation of American States (OAS) that support the reactionary forces and the unlawful, self-proclaimed interim president Guaidó, against the elected president, as well as the governments of the Netherlands and other countries of the EU that have issued an ultimatum, thereby intervening in internal affairs of Venezuela.We especially condemn the military threats of the US, that once again support a coup and try to put aside an elected government for the interests of their monopolies in the region. The US and the other imperialist powers, that aspire the recourses and other means of Venezuela, support the reactionary opposition, exploiting the real problems that the Venezuelan people face, including the enormous inflation and poverty. 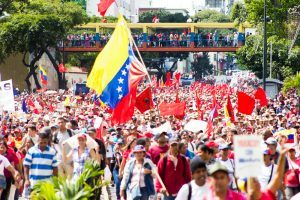 Besides the demonstrations in support of Guiadó that are promoted a lot by the media in the Netherlands, thousands of people also demonstrated in Caracas against the coup attempt of the reactionary opposition. The Communist Party of Venezuela also participated in these demonstrations with its own block. The Communist Party demanded measures against the economic capitalist crisis in the country, that is worsened by the economic blockade imposed by the US and their allies. Measures that are in the interest of the working people such as the distribution of food to counter the effects of the enormous inflation and measures to confront the increased prices of basic products. The NCPN and the CJB express their solidarity to the people of Venezuela, who not only suffer under the economic capitalist crisis and exploitation, but even more because of the interventions of imperialist powers. The NCPNsupports, as it always has, the right of every people to decide on its own future, without external intervention of imperialist forces. We express our solidarity to the Communist Party of Venezuela that does not let itself get tricked by the various bourgeois forces but is consistently struggling in these difficult and complex circumstances for the interests of the working people and the prospect of socialism-communism.